Even when they were in the planning stage, the developers of Treplus Communities’ senior apartments were sure they’d allow pets at their communities. In addition to being animal lovers, the Treplus family recognizes that many empty-nesters view their pets as children who will never move out. And disallowing these cherished family members would turn off many potential residents. For Baby Boomers and Millennials alike, moving to a “No Pets Allowed” community would, in essence, break up the family. Downsizing should never, ever mean getting rid of the dog. In generations past, dogs and cats were kept around for utilitarian purposes and were not allowed in the house. Dogs could herd livestock and protect the home, while cats culled damaging rodents. Today, we spend hours posting and clicking on adorable photos of pets on social media sites. To some, the practice of showing off an angelic puppy or kitty is akin to worship…or obsession. Some of us want to bring our pets everywhere. OK, cat people, here’s where the story ends for you. Cats are not the social butterflies that dogs tend to be. Fact is, many cats seem to be more attached to your house than they are to you. A rare few may enjoy a lap around the park on a leash or in a baby carriage, but most would be appalled at the prospect of a family outing at a neighborhood watering hole. Let’s face it, in a cat’s eyes, we humans are just not that much fun to be around. Most dogs beg to differ, though. Many become anxious even before their people walk out the door. We’ve all heard the stories of frantic canines eating couches and jumping through plate-glass windows in response to being left alone. There is nothing that most dogs adore more than “walkies” with their humans. And included in that incendiary word, there could be an outing to the local pub or bodega to mix it up with two- and four-legged friends. In 2018, Central Ohio is a veritable wonderland of dog-friendly shops, cafes and off-leash parks. And coupled with the recently passed House Bill 263, which enables restaurant and bar owners to allow dogs on their outdoor patios, it’s a blissful storm of canine-human camaraderie. In April 2018, the Ohio House of Representatives overwhelmingly passed House Bill 263 with a 79 to 9 vote. The bill passed the Senate in June 2018 and was subsequently signed into law by Governor Kasich. 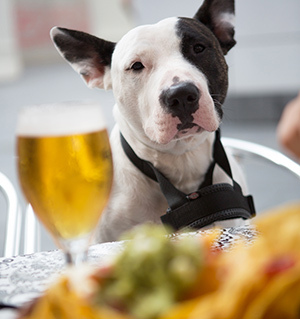 In essence, HB 263 has enabled bar and restaurant owners to decide whether to allow dogs on their outdoor patios. Dogs can kick up dust at Nando’s Dog Park at Darree Fields Park, located at Cosgray and Rings Roads in Dublin, and the Heritage Rail Trail, 7250 Hayden Run Road. Pickerington is also home to the Violet Township dog park, located at 490 North Center Street, just a few blocks from Olde Pickerington Village. Delaware has one of the best dog beaches in the area. The Alum Creek Dog Park at 3615 S. Old State Road in Delaware has areas for large and small dogs, and an expansive beach where dogs can swim and splash. And Treplus senior living communities are well-equipped to comfortably house cats and dogs (and their people!) Hawthorne Commons in Dublin (open and leasing now), Redbud Commons in Pickerington (pre-leasing to open in late 2018) and Burr Oak Commons (under construction, to open in late 2019), all have play areas for dogs, walkways throughout the community, and access to multi-use trails for long walks with the pooch. Treplus senior apartments have mud rooms off the garage entrances, wood laminate flooring materials and single-story designs make for easier cleanup. Even older dogs will be able to navigate these luxury senior apartments easily. Features such as these are genuinely important to all residents, but pet owners are just as concerned about the comfort and safety of their pets!